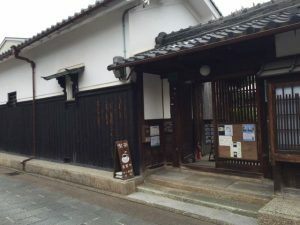 Nakakoji family’s house in Muko-shi Kyoto prefecture is the large traditional house built in 1848, registered as the national cultural property in Japan. It’s on the Saigoku street, which is the historical path made of stones. Now it’s used as the café and the space for the art exhibitions or something. I visited the house to see my senior’s exhibition of kimono. Yukata is the Japanese cloth for summer. We wear it especially at night except the occasion of the summer festival. 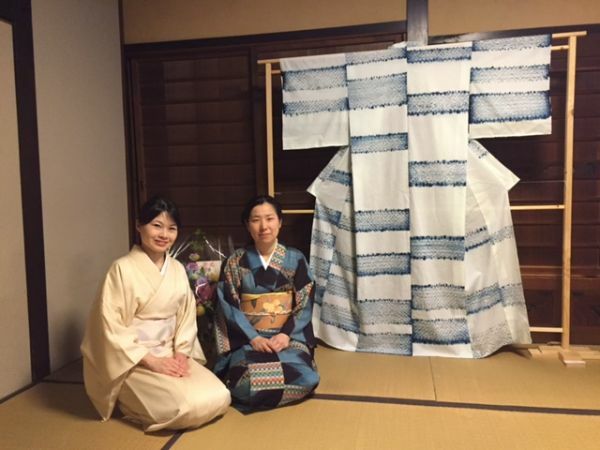 Maiko in Kyoto also wear indigo & white yukata like this with square obi (sash), and white tabi (Japanese socks). It seems cooler in sumer isn’t it? 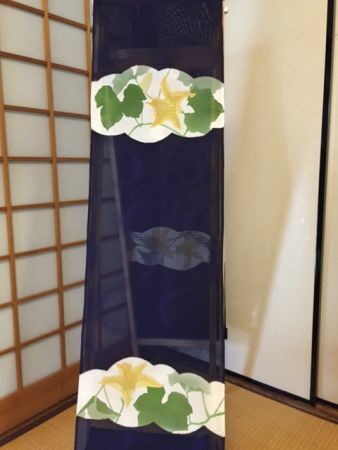 Actually, Mineko-san is a professional for a fabric printed by batik, so it was her first work of tie-dyed fabric. The light and shade of the indigo looked interesting design. Since indigo and batik work can be used at the same time, maybe she will try making yukata using both of the skils next time. 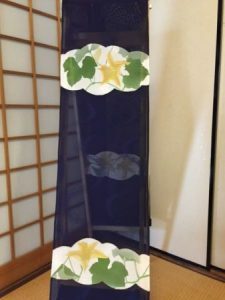 Kimono for Tokyo & Kyoto. The tastes are different from each other. I’ve heard from her that the tastes of kimono are different from Tokyo and Kyoto. 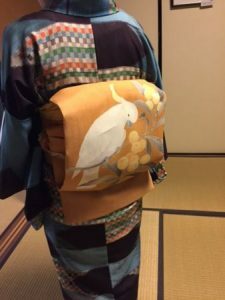 It is said that people in Tokyo like smart and stylish kimono of dark color because they are surounded by the higher buildings made of concret while Kyoto people like soft colors like this yellow. We often see the dark red or deep yellow sash in Kyoto because they look more beautiful in the traditional temples and Japanese gardens. Actually, this yellow sash was made by herself. The fruits of loquat in summer and a pretty bird in Kyoto zoo are painted. In addition, this sash has a front face and a back which show the different appearance of a bird and fruits on the waist. How useful and modern sash it is! Although it’s difficult to see on the photo, but this mesh fabric has the pattern of the wave on it. Gold strings were embroidered around the pumpkin flower to show its outline more clearly. It was created by Ms.Mishima. 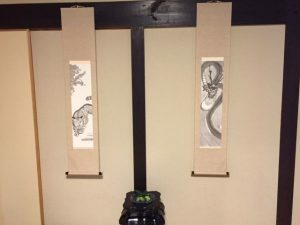 The dragon and a tiger are the popular theme for the traditional folding screens for the temple in Japan, but seeing carefully, it’s not only the dragon and a tiger. They are holding pretty babys on their hands. Now, it’s the big social problem in Japan that many infants can’t enter the public nursery school because of the shortage of schools and teachers even if Japanese government always says they hope women to work outside the house after the mariage or giving birth to children. I spent nice time seeing the interesting arts and traditional architecture in Nakako-ji family’s house. Everything was beauriful, the alcove, kimono, doors, and a garden. 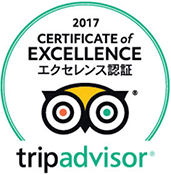 It’s about 8 mintes walk from Nishimuko station of Hankyu line in Kyoto prefecture. 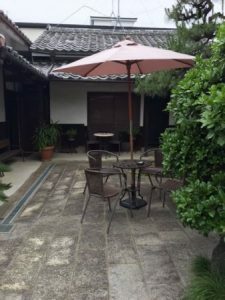 It’s a little far from Kyoto city but refreshing place to feel the nature and traditional life style inherited from generation to generation.